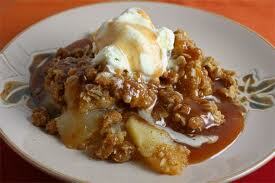 Combine Laurie’s Kitchen Fruit Crisp Topping with melted, salted butter. Mix well and set aside. In a separate bowl, combine peeled, cored and sliced baking apples with Laurie’s Kitchen Fruit Crisp Spice Seasoning. Stir until coated. Spray the bottom of an 8×8 baking dish with non stick cooking spray. Spoon prepared filling into bottom of baking dish. Top with prepared crisp topping. Bake for 45 minutes. Let stand 10 minutes before serving. Top with vanilla ice cream for extra decadence!